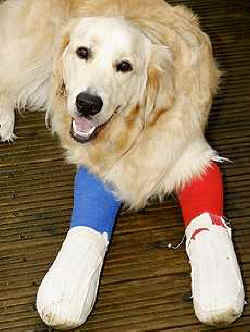 Mac the golden retriever is being dubbed a "walking miracle" by his owner after falling (or flying!) 40 feet off a cliff in the U.K.'s Isle of Wight. The 1-year-old pooch was on vacation with owner Margaret Sills when he spotted a rabbit, ran through a bush over the cliff and fell onto some rocks, according to the newspaper Peterborough Today, which first reported the story. "I can't praise the vets enough for what they have done," Sills said. "I really thought I had lost him. He can't walk very far at the moment but compared to how he was a few weeks ago, he is a walking miracle." It took rescuers three-and-a-half hours to reach Mac after he fell of the cliff on July 10, but the coast guard quickly transported him to a hospital in the Isle of Wight, where he was treated for several days. Then he was transferred to Broadway Veterinary Hospital in Peterborough, England, near Sills's home, to continue to recover from a collapsed lung, broken front legs and pelvic bruising. The staff at the hospital had to perform two separate operations to repair Mac's fractures and inserted two metal plates and splints to support his broken legs, Hayley Stevenson, head nurse at the hospital, tells PEOPLE Pets. "It will take quite a few weeks -- I would imagine in six months maybe -- to see whether he will have 100 percent full function of his [front] legs," Stevenson says. "In six weeks we will take an X-ray, and probably go from there." Mac's spirit throughout the painful ordeal has been inspiring, says Stevenson. "He is the most fantastic dog ever -- he is amazing. He is so happy, so loving, wants to give absolutely anyone a kiss," she raves. "Just so patient now matter what we did. Very, very tolerant." And Mac is adjusting well to his new splints -- maybe even a little too well. "He is too bouncy at the moment for his own good, really," says Stevenson with a laugh. "He needs to calm down on those splints a little bit."